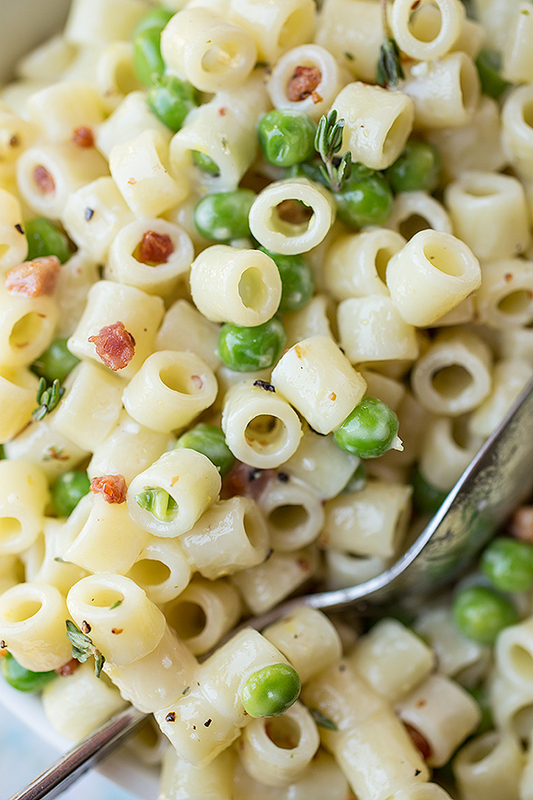 Macaroni salad is a cool and refreshing beloved staple, and with this recipe I bring you a delightful mix of peas and crisp pancetta coupled with the bright flavors of lemon and thyme! When I think of a spread fit for the warmer seasons, I simply cannot imagine it without a delicious macaroni salad. Don’t we all just love to reach for a big creamy and cool spoonful? Sometimes, however, macaroni salad can be a wee bit on the heavy side and quite rich. But, there’s a simple and flavorful solution to that, and it involves a few super flavorful ingredients: zippy lemon, pretty green peas, fresh and fragrant thyme, and crisp pancetta. What lemon offers is a wonderful tanginess, and when used in combination with an herb such as thyme in a creamy dressing base for the macaroni salad, it cuts through the richness and allows for a bit more “brightness” to come through. Petite green peas offer a little something fresh and green under tooth, offering up a bit of extra texture and nice color. But the special little unexpected gourmet twist? 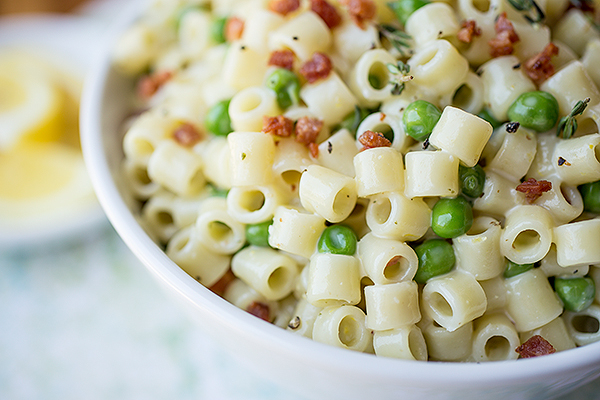 A sprinkling of crisp pancetta, which gives this particular macaroni salad recipe a slightly salty bite. The results of this tasty combo of ingredients is a lighter, fresher and more flavorful macaroni salad to offer up! Preparing a delectable macaroni salad is as easy as adding all of the ingredients into your bowl and mixing together, then allowing the salad to absorb all of those delicious flavors while it chills in the fridge. To begin, I cook my little ditalini pasta (my favorite kind of pasta for this recipe) according to package instructions; then, I drain and rinse the pasta under cold water. While my pasta is cooking, I prepare my creamy dressing by adding all of my ingredients to a food processor and processing until smooth and well blended (you could also whisk the ingredients). To assemble my macaroni salad, I add all of my ingredients to a large bowl, toss together, then turn out into a serving dish; I garnish, and keep the salad cold in the fridge until ready to serve. Ditalini for dainty pasta: I use a pasta called “ditalini” (Italian: “small thimbles”), and you should be able to find it in most grocery stores; however, if you can’t, just substitute small elbow pasta. Crisping pancetta: If you can find pre-diced pancetta, then use that; otherwise, just finely dice the pancetta, then give it a crisp in a hot pan for a few minutes. Prep ahead of time: You can easily prepare the salad a day ahead, and keep it in the fridge—as a matter of fact, it’ll take on even more flavor! Lighten things up even more: If you’d like to go a even lighter, or use less mayo, you can sub plain, Greek yogurt for half of the amount of mayo in the dressing. Food processor to make your process easier: Blending the dressing in the food processor is the quickest and easiest way to prep the dressing; but if you don’t have one, no worries, just add all ingredients to a bowl and whisk until blended. 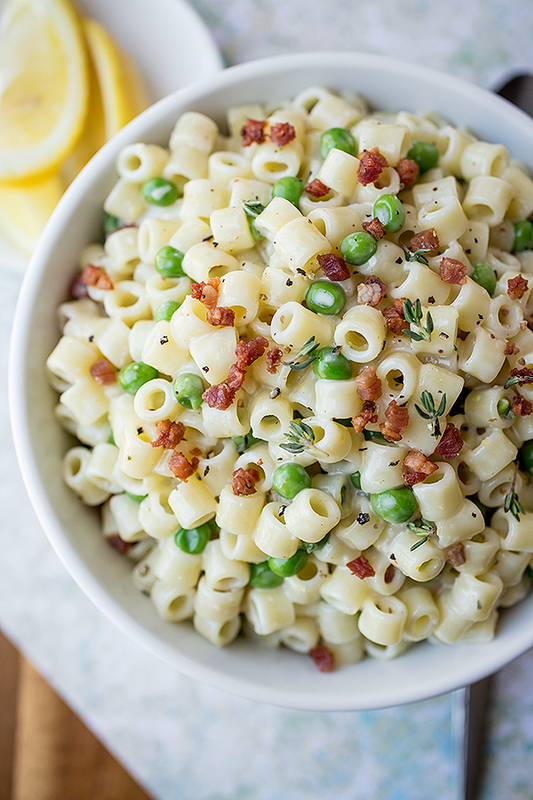 This macaroni salad has a delightful mix of peas and crisp pancetta coupled with the bright flavors of lemon and thyme! -To begin, cook your pasta according to package instructions; drain and rinse under cold water. -While the pasta cooks, prepare your dressing: add all ingredients into the bowl of a food processor, and process the mixture until thick and completely creamy; or, whisk all ingredients in a medium bowl until blended; keep cold. 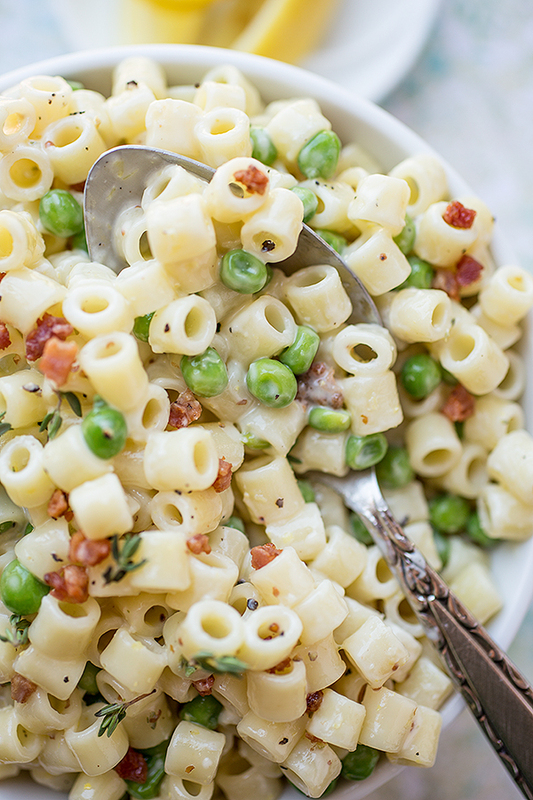 -To assemble the macaroni salad: add the cooked and cooled macaroni to a large bowl, and add in the thawed petite peas and the diced, crisped pancetta; toss well with the dressing, then spoon into a serving bowl, and garnish with the thyme leaves; chill for an hour or two, and serve cold. Hungry for more tasty salad recipes? 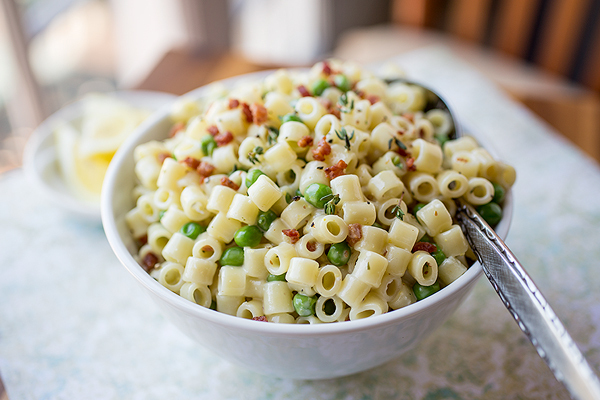 Check out this Italian Pasta Salad, this Lemon-Basil Pasta Salad, or this Macaroni Salad with Spring Vegetables! Cook’s Note: This recipe was originally published in 2013, has been updated with even more love! The size and shape of pasta makes such a difference to me,so I love that you used the little cylinder-shaped kind (to be technical about it, ha!) I too love lemons in spring and summer- they really do wake everything up! I am collecting summer recipes for our big RV trip out west and this one is definitely going in the collection. Thanks for sharing! Oh, that’s awesome MC! Thanks so much…I really hope you all enjoy this recipe, and that you have a wonderful and rejuvenating RV trip!! This looks delicious! I am always on the hunt for the next great pasta salad. Love your idea to use pancetta! I’m so happy to have found your site! I love it! I saw this gorgeous salad on tastespotting and had to click over immediately! This salad looks so delicious! I love the bits of pancetta along with the peas in that creamy lemony dressing! I’ll be making this very soon! Thank you for your kind words, Caroline; I hope you enjoy the recipe! I made this today (without the pancetta) and it is delicious! My 7 yr old is gobbling it up! I made this pasta salad last night and absolutely LOVED it! I luckily had some leftovers, so I added roasted chicken and it’s made the perfect lunch today. Thanks so much for sharing, I’ll be making this over & over this summer … perfectly fresh and tasty. That sounds like an absolutely perfect lunch idea, Grace! 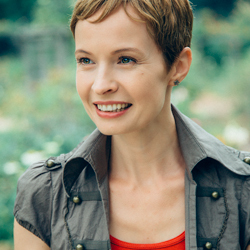 So glad you enjoyed this little ditty…and thank you for your comments! I found this recipe on Pinterest and decided to try it for a 4th of July BBQ I am hosting tomorrow. I picked it for the colors and because it is a more “grown up” mac salad. The salad is fantastic! I love the bright lemon flavor with the sweetness of the peas and saltiness of the pancetta. It’s so good I’m having a hard time staying out of it! Thank you for sharing the recipe! Yummmmm! I made this for the Forth of July today…amazing! Thank you so much for sharing! My pleasure! I’m glad this little salad got to be a tasty part of your 4th of July festivities! Made this last night and it was really good….makes a lot, though! I’m freezing half of it just to see how well it does in the freezer. Thanks Becky! My box only said “salad macaroni” on it, but I found that the name is “Ditalini”, and it looks like Barilla brand has that type of pasta (the small, tube-shaped kind). Hope you enjoy! Thank you so much! I’m going to make it for a party this weekend! I made this salad tonight and it was so, so good! I am having a hard time staying out of the refrigerator! The pancetta is a perfect touch. Thanks for the great recipe. I am definitely going to try this! However, I am going to use asparagus spears instead of peas. Should go well with the pancetta. Thanks for the recipe! Always looking for new things to have in the summer. I am in love! So many of my faourite things! Would it be wrong to eat this everyday? To Becky – I have used this pasta several times and it is called Ditalini. I hope this helps 🙂 Also, I love this pasta salad as well. This salad rocks!! My husband almost ate the entire batch! I’m lucky I even got a few bites. Amazing flavor and yet so light. Thank you! Jill, thanks so much for sharing that with me – on one hand, I was thrilled that the hubby really enjoyed it so much (we know how important that is, right? ), but on the other hand, I felt kinda bad that you only got some scraps, haha! 🙂 Anyway, so happy this was a success for you! I made this tonight. It is delicious! I made 1/2 recipe, subbed bacon bits for the pancetta, and added 1 pound of chilled shrimp. I did not halve the dressing, due to the addition of the shrimp. The dressing is fabulous. Served it with garlic toast. I loved it. Ooh, that sounds delish! Perfect substitutions/additions for this particular salad, as this dressing is lemony and a bit tangy—great with shrimp! Thanks for sharing your experience with me. I found this on Pinterest posted by Carson Kressley. It sounds fabulous! Will try this weekend. Hi- this looks amazing and we’ll be having this for dinner tonight. I was just wondering if you had any awesome ideas on what to serve it with? I have a fussy 1 year old, 3 year old and 27 year old to feed 😉 Thanks so much! I found your recipe last year and it has become my family’s absolute favorite macaroni salad. It is now a staple at all large family gatherings. I made it again last night for our Memorial Day BBQ and was reminded how much I love love love it. Natasha, how sweet of you to share that! I’m so honored to have this salad be a “staple” item at your family gatherings—it’s the perfect way to enjoy it! 🙂 Thank you very much for your kind comments, and for bringing one of my recipes into your family circle. I am planning on adding this to my 4th of July menu. I have one question. Do you think I could heavily whisk the dressing ingredients instead of using a food processor? This looks so lovely and refreshing. If I don’t have access to fresh thyme and therefore can’t garnish, how much dried thyme should I add to the dressing? Thanks Mardi! You know, you could still garnish with a sprinkle of dried thyme, no problem at all. And as far as the amount for the dressing, typically, it’s said that one should use about half the amount of dry herbs to fresh, so use about 1/2 teaspoon (or a pinch more, there’s no harm) in place of the fresh. Enjoy! I made this today…..used thick cut bacon, cooked well done & crumbled & a tad more fresh lemon. DELICIOUS!!!!!! !i will be making this again!!!! Melissa, that sounds delicious!! Happy you enjoyed this recipe, and thank you for sharing your experience with me. Just made this. It is delicious. We ate 1/2 of it “taste testing”. Will definitely make next time I entertain. I have two family members that are allergic to Mayo. Any ideas for a mayo substitute that would also be dairy-free (no yogurt)? Hi Janet! Thanks for your question. There’s a product called “Veganaise” that is a vegan, non-dairy mayo substitute, and you can easily use that. It’s sold at Whole Foods Market and Sprouts—perhaps other markets, as well, in their vegan section. Enjoy! Do you cook the peas? Hi there! No, they’re good to go; they’re blanched prior to being frozen, so once thawed, they’re perfectly fine to add just as they are. I served this to a large 4th of July BBQ. Everyone raved about this mac salad–this is a keeper. Hi Carol, I’m so excited to read that! Thanks for sharing my recipe with your loved ones at your celebration, and thank you for taking a moment to let me know what your experience was! This recipe looks amazing! I’d love to whip this up to bring to my friend’s housewarming cookout, but I don’t own a food processor. Any suggestion for getting the dressing right without one? Hi Carly, you can very easily prepare the dressing in a larger bowl using a whisk to blend everything up—the processor just makes it easier, but it’s absolutely not necessary. Hope you enjoy for the housewarming cookout! I just submitted a similar question and then spotted this, so no need to answer my last one. Thanks! I look forward to making it tonight. Hannah, that’s so very, very sweet! And I’m sure you are a great cook—look at you making your own substitutions with the dill and rosemary! 🙂 So happy that you’ve been enjoying this summer salad recipe, and thanks for letting me know! Just wanted to let you know that this was a big hit! We have been eating this all summer long, and just can’t get enough of it! Now, at our house, when we say “macaroni salad”, this recipe is what we mean. Karen, that is absolutely precious to me, and I thank you for sharing that! So happy you’ve been enjoying this macaroni salad this past summer season! Sounds yummy but how do you crisp the pancetta? Hi Carolyn, you crisp it the way you would bacon, in a hot pan. Hope that helps! I made this last year for a BBQ and repeated again this year for a different crowd. 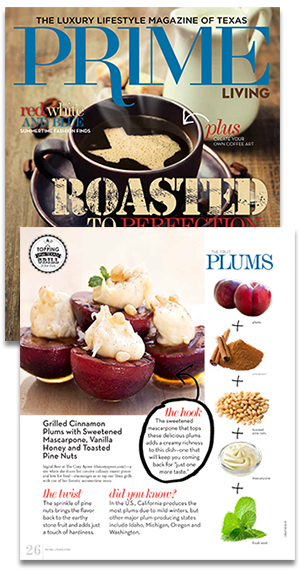 Both times I have received many complements and had people ask me to send the recipe. I would add another 1/2 c of peas the next time I make it. The dressing is really perfect. Hi Colleen, I’m thrilled that this recipe is getting such good reviews from the folks you’re serving it to! How exciting, and thank you for sharing that with me! I love to read that. Thank you for your comments! This salad is a great salad to make during the hot and humid days of summer. I love it! I’m wondering how slivered sun dried tomato (the oil packed ones from Trader Joes) will be in it . . . This salad was AMAZING!! I want that Lemon Thyme Dressing on everything. I could not for the life of me find Pancetta at the store that day, so I substituted ham and it was still fantastic. Can’t wait to make it again, this time with Pancetta as intended. Haha, thanks so much, Lindsey! Great substitution, by the way. Very glad that you’re enjoying the salad, AND the dressing so much! 🙂 Thank you for your comments. I grew up in the South and pasta salad was always on hand with new recipes. The recipes are from all over everywhere. Just depends on your mood. It’s hard to kill pasta except by overcooking. I’m old enough to remember Europe on $5 a day. We ate in the cafes where the locals ate everywhere. Lots of pasta all over. YUM! You just added another recipe to the collection and my lunch tomorrow. Hi Becky, thanks for your comment, and I hope you enjoy this pasta salad! I’ve discovered this recipe 2 years ago. Family and friends have loved this. It’s my go to summer pasta salad. ( all seasons really). Such a refreshing taste. Love it. Should i double the recipe forn22 people as a side dish? Hi Mary, no problem at all! I would tell you to just use what you know you all like; I’d go with either parsley, or basil, or maybe even some chives. Hope you enjoy! I’m hosting a small (4 people) art class tomorrow and couldn’t figure what to serve with a cucumber soup so decided to search your archives. I’m going to serve this alongside and think I may need to hide it so Darling Daughter doesn’t scarf it down! 😎 We so love anything with lemon so I can’t wait. Hi sweet Roseanne, if you love lemon, then I think you will definitely enjoy this recipe—good choice! Your gathering sounds so cozy & fun, and I hope you all have a spectacular time together! How creative. Okay, Ingrid….this was a HUGE hit! The lemon is such a refreshing and surprising change of pace for pasta salads. One of my friends said she rarely eats pasta salad but really enjoyed this one. I absolutely loved it. A question…in many of my other recipes, I have been subbing 1/2 yogurt 1/2 mayo. What do you think? Too potentially tart? I may just leave well-enough alone. So yummy. You and I are both big fans of lemon and “tang”, so your combo of mayo and yogurt (1/2 and 1/2) is not too much in my opinion; I actually have a really delicious sauce for my Shrimp Taco recipe (the “awesome sauce”) that uses that ratio, and it’s really good. I personally think “tang” is important when it comes to creamy sauces (even soups); I made this Lemon Chicken Salad using only yogurt plus lemon and herbs for a “lightened up” chicken salad as well. I’d say always use your preference. If you like the mayo/yogurt combo (I love it), use it. All you have is your own palate at the end of the day!